What is the correct concept behind measures of inflation? Does money cause business activity or is it the other way around? Shall we stimulate growth by raising aggregate demand or rather by lowering taxes and thereby providing incentives to produce? Policy-relevant questions such as these are of immediate and obvious importance to the welfare of societies. The standard approach in dealing with them is to build a model, based on economic theory, answer the question for the model world and then apply the results to economic phenomena outside. Data come in, if at all, only in testing a limited number of the model's consequences. Despite some critical voices, economic methodology too has by and large subscribed to a "theory first" approach to applied economics. Error in Economics systematically develops an alternative to the theory-based orthodoxy. 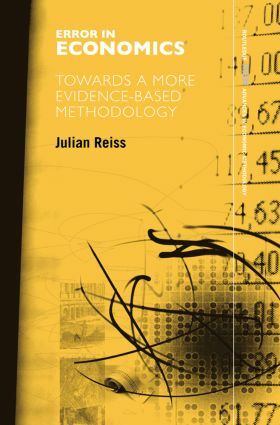 It places the methodical study of evidence at the centre of the scientific enterprise and thus provides a foundation for a methodology of evidence-based economics. But the book does not stop at the truism that claims should be based on the best available evidence. Rather, detailed studies in the areas of measurement, causal inference and policy analysis show what it means for a claim to be evidence-based in the context of a concrete case. The examples discussed concern topics as diverse as consumer price indices, radio spectrum auctions, the transmission mechanism, natural experiments on minimum wages and the evaluation of counterfactuals for policy. Error in Economics is essential reading for economic methodologists, philosophers of science and anyone interested in how claims about socio-economic matters are validated. Julian Reiss is Assistant Professor in the Department of Philosophy at Erasmus University, Rotterdam, and a Research Associate of the Centre for Philosophy of Natural and Social Science, London School of Economics.